Right after the FISM Convention, a few magicians will perform for the general Chinese audience. It is another pleasure and honor to be part of this show. 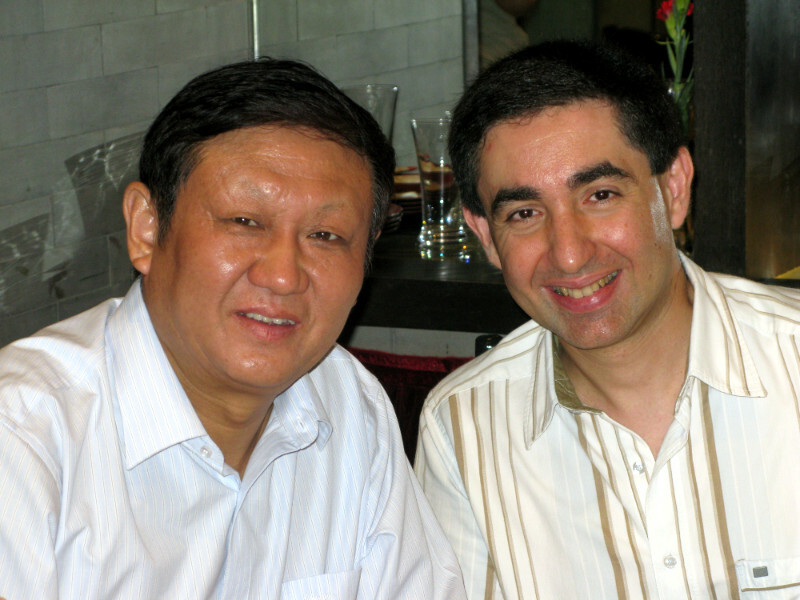 The “Supreme Magic” show, following the World Congress, is intended for the Chinese audiences. It is a huge success, at the Beijing’s International Exhibitions Center’s theater. The 2000 seats are fully booked at every show. Each one from the 9 magicians is representing another country: DOUBLE FANTASY (Ukraine), I.MA.GI.A. (Italy), JORGOS (Greece), Eun-Gyeol LEE (South Korea), Jeff McBRIDE (U.S.A.), Peter MARVEY (Switzerland), Omar PASHA (France), TOPAS & ROXANE (Germany), YUNKE (Spain). Mike MILLER (U.S.A.), president in 2009 of the S.A.M. 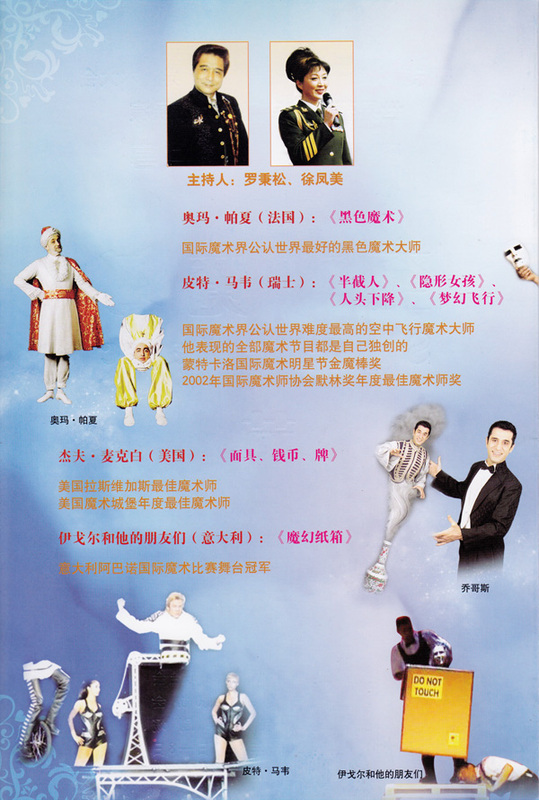 (Society of American Magicians), is the stage manager, acting as an interface between the Chinese stage management and the artists. The daily route between the hotel and the theater gives us the opportunity to cross a large part of the modern city, between more or less recent towers, along streets, avenues and expressways. Very often, they are jammed. While Paris (and other occidental metropolises) have more and more cyclists in their streets, Beijing has less and less two-wheeled vehicles and always more cars, inclusive many four-wheel drives. Those who can afford big-engined German cars or huge Asiatic four-wheel drives have no great worries about carbon dioxide. Despite many obligations, we have been able to visit quite a few prestigious places in and around the Chinese capital city: the worldwide known Tiananmen Square, one of the largest squares in the world, the Forbidden City (along that square), the former Palace of the Chinese Emperors (which is visited today by millions of tourists, mainly Chinese tourists), the Summer Palace, attracting as well similar crowds, the Great Chinese Wall, a few dozens of kilometers away from Beijing. We also have a few walks around and in the Olympic Stadium, the famous Bird’s Nest, and in the business areas. There, architects from all over the world give free rein to their creativity for huge and spectacular towers, head offices of numerous Chinese and international companies. But time is short for many other visits. So, we have to come another time to Beijing. We only caught a glimpse of the Hutongs, those old working-class areas with low-roofed grey houses. With the reason of modernizing and improving the living conditions, those districts are quickly destroyed, to many of their inhabitants’ great displeasure. When some of those people enjoy taking advantage of the modern comfort in distant suburbs, others resist. But it is a rearguard action. A small part of those Hutongs is preserved and transformed into a picturesque area for the local happy few and for foreigners. Looking at Louis-Olivier’s pictures in the Photo Gallery, you will see some of his Beijing’s impressions. Beijing, and the other parts of China we have seen, gives an incredible energy feeling. A national pride and a sense of Chinese greatness are most certainly alive: the ancestral past seems to be a very important background and the future is in construction. All efforts aim at this goal. The incredibly rich past is magnified, through spectacular monuments’ and palaces’ restorations. And the Chinese people from all over the country are the first to visit and admire them. The present is built at top speed. The future seems assured; the dream for wealth and strength comes true (for some people). In fact, many people have the feeling to have an easier life than previously. This is enough for many to move forward, to work, work and work always more. 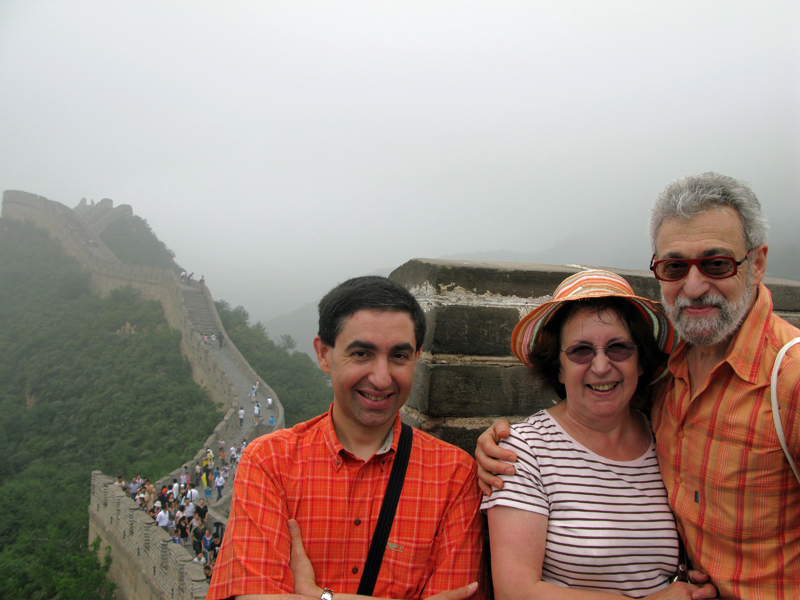 See also more pictures about Beijing in the GALLERY section, click : “Magic in Beijing, 2009” .